Using videos in lessons is nothing new for most teachers, but what if there were an easy-to-use tool which insured active listening over passive and were able to provide assessment for learning, gauging understanding and informing future lessons? Enter EDpuzzle. 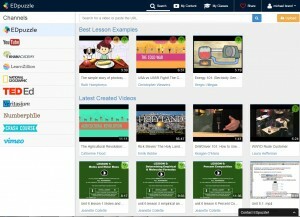 EDpuzzle is a free online video editing site, allowing users to manipulate content available on the web or indeed upload personal videos for editing. Its first key feature is the ability to crop videos: no more waiting around for your internet to load 11:44 or telling your pupils to “Listen, there’s an important part coming up!” So far, so simple. What’s really useful here is the ability to embed questions (open-ended or multiple-choice) in the video. We can keep our students on their toes as they’re watching. Indeed, EDpuzzle allows teachers to create a class and assign work to students: with the report it provides we can see what they have and haven’t understood, how many times they’ve watched a video, or indeed whether they’ve done their homework at all: useful actionable data. How to use EDpuzzle in class? A teacher might use EDpuzzle for videos to use in class or as part of an enhanced flipped classroom with built-in assessment, but why not flip the flipped classroom and harness student creativity too? Teachers can assign projects to learners and motivate them to make and share their own EDpuzzles: they could use the voiceover function to play the roles of their favourite characters on Friends, trying to imitate their accents or come up with an entirely new script for a video, record themselves and embed questions to be answered by their peers. The perfect tool for video in education? Not quite. You can’t merge parts of a video together, nor can you combine different videos. I’m also puzzled (sorry!) by the lack of a subtitle feature. You can include audio notes with pauses in the video, but as far as voiceovers go, there’s no editing segments: it’s all or nothing. However, despite these minor issues, EDpuzzle is one of the most exciting new digital resources out there, providing not merely bells and whistles, but functions which can have a real impact on teaching and learning. This entry was posted in Uncategorized and tagged 21st Century Skills, Digital Resources, Edtech, Technology by Michael Brand. Bookmark the permalink. Pingback: Using ESL videos: Hit play and get ready to learn!